Capt. Edward J. Smith seen on the Olympic. William McMaster Murdoch was born Feb. 28, 1873 in Dumfries and Galloway, Scotland, the fourth son of Captain Samuel Murdoch, a master mariner, and Jane Muirhead, six of whose children survived infancy. The Murdochs were a long and notable line of Scottish seafarers who sailed the world's oceans as early as the 19th century; William's father and grandfather were both sea captains as were four of his grandfather's brothers and it is little wonder that he followed in the family tradition. He served his apprenticeship aboard the Charles Cosworth of Liverpool, trading to the west coast of South America. It would have been a harsh apprenticeship, but it gave Murdoch the determination he needed to succeed. From May 1895 he was First Mate on the Saint Cuthbert, which was to sink in a hurricane off Uruguay in 1897. Murdoch gained his Extra Master's Certificate at Liverpool in 1896, at the age of 23. From 1897 to 1899 he was First Officer aboard the J.Joyce & Co. steel four-masted 2,534-ton barque Lydgate, that traded from New York to Shanghai. The final stage of Murdoch's career began in May 1911, when he joined the new RMS Olympic, at 45,000 tons. Intended to outclass the Cunard ships in luxury and size Olympic needed the most experienced large-liner crew that the White Star Line could find. Captain Edward J. Smith assembled a crew that included Henry Tingle Wilde as Chief Officer, William Murdoch as First Officer, and Chief Purser Henry W. McElroy. On June 14, 1911, Olympic made her maiden voyage to New York. However, upon reaching Southampton, he learned that he had been appointed as Chief Officer of the new Titanic, sister ship to Olympic and reputedly the largest and most luxurious ship afloat. Lightoller later remarked that "three very contented chaps" headed north to Belfast, for he had been appointed First Officer, and their friend Davy Blair was to be the new second officer. Awaiting them would be an old Adriatic hand, Joseph Groves Boxhall, as Fourth Officer, and others who would be familiar colleagues, including the now ageing Edward John Smith, as Captain, and on the verge of retirement. Thirty-nine year-old Murdoch, with an "ordinary master's certificate" and a reputation as a "canny and dependable man", had climbed through the ranks of the White Star Line to become one of its foremost senior officers. It was only natural that he was selected to be Titanic's Chief Officer, with sixteen years of maritime experience now behind him. 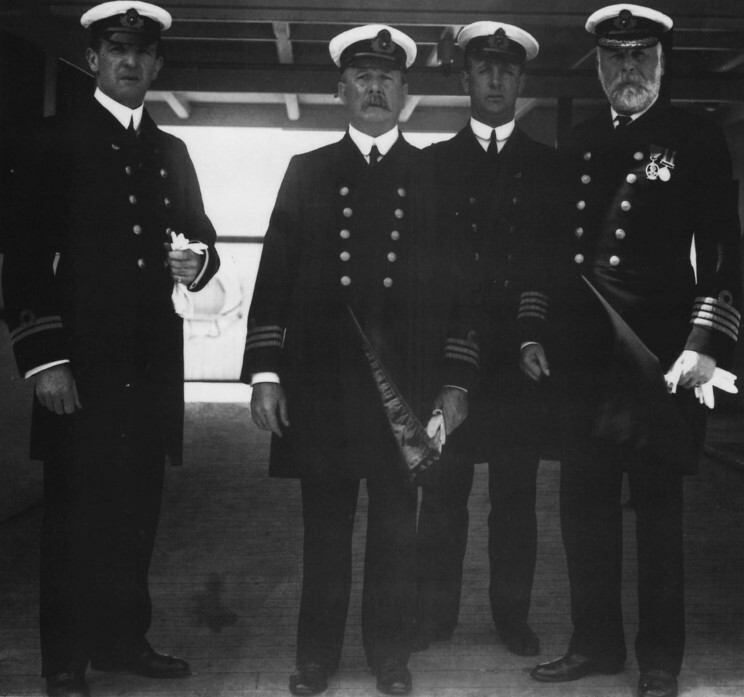 Murdoch had originally been assigned as the ship's Chief Officer, though when the Titanic's skipper E.J. Smith brought Henry T. Wilde, his Chief from his previous command, Murdoch was temporarily reduced to First while First Officer Charles Lightoller was in turn reduced to Second. The original Second, David Blair, would sit out the voyage altogether while the rest of the ship's complement of officers remained unchanged. Murdoch was the officer in charge at the bridge when the Titanic struck the iceberg on April 14, 1912. He gave orders to 'full speed astern' and 'hard a starboard'. Some historians argue that reversing the engines gave a higher chance of hitting the iceberg than reducing the ship's forward motion and slowly turning the ship. Nonetheless, Murdoch was put in charge of the starboard evacuation where he was last seen attempting to launch Collapsible Lifeboat A. After Titanic disappeared into the Atlantic Ocean on the morning of April 15, 1912, nothing more was ever seen of 1st Officer William Murdoch. His body, if recovered, was never identified. Within days of the disaster, several crew members and passengers began to speak of a suicide that occurred near the end of Titanic's sinking. It was initially unclear of who may have committed suicide, some claiming it was Captain Smith, Chief Officer Wilde, or Murdoch. However, these accounts are unconfirmed. Several members of the crew, including the ship's lamp trimmer, Samuel Hemming, and Second Officer Charles Lightoller said they saw Murdoch hard at work attempting to free Collapsible A from the falls on the Boat Deck just before the bridge submerged in the final stages of the sinking, when a huge wave washed him overboard into the sea. Surviving wireless operator Harold Bride later stated that he saw Murdoch nearby Collapsible Lifeboat "B," but that he died in the water. In his home town of Dalbeattie , Dumfries and Galloway , Scotland there is a memorial to his heroism and a charitable prize has been established in his name.